Chinatown is a neighborhood in Downtown Los Angeles, California that became a commercial center for Chinese and other Asian businesses in Central Los Angeles in 1938. The area includes restaurants, shops and art galleries but also has a residential neighborhood with a low-income, aging population of about 20,000 residents. 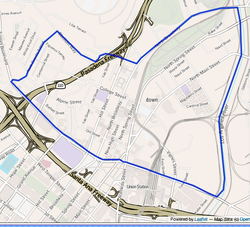 Street and natural limits of the Chinatown neighborhood are: north, Beaudry Avenue, Stadium Way, North Broadway; east, the Los Angeles River; and southwest, Cesar Chavez Avenue. Chinatown beyond the concentrated business center is flanked by the Elysian Park to the north, Lincoln Heights to the east, Downtown to the south and southwest and Echo Park to the west and northwest. There are two schools and a branch library in Chinatown, as well as a city park and a state park. Many motion pictures have been filmed in the area. In 1871, 19 Chinese men and boys were killed by a mob of about 500 white men in one of the most serious incidents of racial violence that has ever occurred in the American West. This incident became known as "Massacre of 1871". From the early 1910s, Chinatown began to decline. Symptoms of a corrupt Los Angeles discolored the public's view of Chinatown; gambling houses, opium dens and a fierce tong warfare severely reduced business in the area. As tenants and lessees rather than outright owners, the residents of Old Chinatown were threatened with impending redevelopment, and as a result the owners neglected upkeep of their buildings. Eventually, the entire area was sold and then resold, as entrepreneurs and developers fought the area. After thirty years of decay, a Supreme Court ruling approved condemnation of the area to allow for construction of a major rail terminal, Union Station. Residents were evicted to make room for Union Station without a plan for the relocation of the Chinatown community. Chinatown was gradually demolished, leaving many businesses without a place to do business and forcing some to close. A remnant of Old Chinatown persisted into the early 1950s, situated between Union Station and the Old Plaza. Several businesses and a Buddhist temple lined Ferguson Alley, a narrow one-block street running between the Plaza and Alameda. The most notable of the surviving buildings was the old Lugo house, having been built in 1838 by the prominent Californio family. Some decades later, the Lugo house became the original home of Loyola Marymount University, and later, it was rented to Chinese-Americans who ran shops on the ground floor and a lodging house upstairs. Christine Sterling, who had brought to fruition the Olvera Street and China City projects, argued that remaining buildings of Old Chinatown were an eyesore and advocated successfully for the razing of all the remaining structures between the Plaza and Union Station. Seven years passed before an acceptable relocation proposal was put into place, situating a new Chinatown in its present location. Christine Sterling, who worked on the conversion of a neglected street into the Mexican-themed Olvera Street, conceived of a similar plan for the displaced Chinese American population. In 1938, she opened China City, a walled enclave featuring Chinese-style architecture, restaurants, shops, rickshaw rides, a lotus pond, and a temple. Costumed workers greeted tourists, and a Chinese opera troupe performed live shows in front of the shops. Some replica buildings in China City came from the set of the 1937 Hollywood blockbuster, The Good Earth. China City received mixed support from Chinese American residents and businessmen. Many welcomed the economic opportunity the project provided. Others preferred the New Chinatown project, considered less distorted by the stereotyping lens of Hollywood. During its eleven-year existence, China City was destroyed by fire and rebuilt numerous times. In 1949, an act of arson destroyed China City. The neighborhood that has become Chinatown was formerly Little Italy. In the early 20th century, Italian immigrants settled in the area north of the Old Plaza. Many built businesses, including wineries (San Antonio Winery is still in existence). The Italian American Museum of Los Angeles in the El Pueblo de Los Ángeles Historical Monument opened in 2016. The Hop Sing Tong Society is situated in Central Plaza, as are several other Chinatown lodges and guilds. Near Broadway, Central Plaza contains a statue honoring Dr. Sun Yat-sen, the Chinese revolutionary leader who is considered the "founder of modern China". 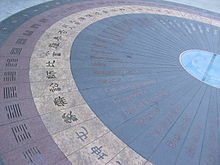 It was erected in the 1960s by the Chinese Consolidated Benevolent Association. A 7-foot tall statue of martial artist Bruce Lee was unveiled at Central Plaza on June 15, 2013. In 1996, Academy Award-winning (for the Killing Fields in 1985) Cambodian refugee, physician and actor, Haing S. Ngor, was killed in the Chinatown residential area in a bungled robbery attempt by members of an Asian gang. It had been speculated that he was assassinated for his activism against the Khmer Rouge government of Cambodia, but this idea was later proved unfounded. On June 28, 2008, a celebration of the 1938 founding of New Chinatown was held with the L.A. Chinatown 70th Anniversary Party. "Though lacking the hustle and bustle of San Francisco's Chinatown, Los Angeles' version has charms of its own." As new developments are approved, city officials and housing activists debate how much affordable housing should be included amidst the market rate apartments and condominiums. The 2010 U.S. census counted 20,913 residents in the 0.91-square-mile Chinatown neighborhood, excluding the population of the Los Angeles County Jail complex. That made an average of 9,650 people per square mile, which included the empty Cornfield area. The ethnic breakdown in 2010 was: Latino, 36.7%, Asian, 34.6%; blacks, 13.8% whites, 12.4%; and others, 2.3%. The median household income in 2010 dollars ($29,000), was the third-lowest in Los Angeles County, preceded by Watts ($28,200) and Downtown ($24,300). The percentage of households earning $20,000 or less (53.6%) was the third-largest in Los Angeles County, preceded by Downtown (57.4%) and University Park (56.6%). The average household size of 2.8 people was just about the city norm. Renters occupied 91% of the housing units, and home- or apartment owners the rest. Just 11.7% of Chinatown residents aged 25 and older possessed a four-year degree in 2010, the sixth-least in Los Angeles County. Little Joe's Italian Restaurant was demolished and the site was redeveloped as Blossom Plaza. Little Joe's Italian American Restaurant, demolished in January 2014, had long stood at the corner of Broadway and College Street. It closed in December 1998 due to the expense of retrofitting the building to meet earthquake standards. The interior was left unchanged and it has been used as a filming location. A midnight firecracker display occurs every Chinese New Year's Eve at Thien Hau Temple and Xuan Wu San Buddhist Association. Chinatown has served as the setting for many Hollywood films. The conclusion of the film Chinatown was filmed on Spring Street. The movie Rush Hour was filmed on location in Chinatown. It is said that a stroll down Old Chinatown Plaza has many rewards, including recognizing many other locations that are used in filmmaking and television production. ^ Espinosa, Maggie (22 January 2008). "L.A.'s Chinatown: A bit of Asia in our own backyard". San Diego Union-Tribune. North County Times. Retrieved 24 May 2018. ^ Johnson, John (10 March 2011). "How Los Angeles Covered Up the Massacre of 17 Chinese". LA Weekly. Retrieved 1 August 2016. ^ Watanabe, Teresa (August 3, 2008). First lady puts Thai Town on the map. Los Angeles Times. ^ See, Lisa (2003). Angels Walk - Chinatown. Angels Walk LA. ^ Cheng, Suellen; Kwok, Munson (June 1988). "The Golden Years of Los Angeles Chinatown: The Beginning". The Los Angeles Chinatown 50th Year Guidebook. Archived from the original on 2000-10-17. ^ a b c William D. Estrada (2008). The Los Angeles Plaza: sacred and contested space. University of Texas Press. pp. 242, 244. ISBN 978-0-292-71755-8. ^ Smith, Icy; Wang, Emily (2001). The lonely queue: the forgotten history of the courageous Chinese Americans in Los Angeles. East West Discovery Press. ISBN 978-0-9701654-1-1. ^ Marge Bitetti (2007). Italians in Los Angeles. Arcadia Publishing. pp. 7–8. ISBN 978-0-7385-4775-6. ^ a b Quon, Cameron (November 4, 2015). "Chinatown: The Tale Of Three Plazas". Annenberg TV News. Retrieved 19 January 2016. ^ Tsui, Bonnie (2009). American Chinatown: A People's History of Five Neighborhoods. New York: Free Press. p. 117. ISBN 978-1-4165-5723-4. ^ Ohanesian, Liz (February 12, 2015). "Bruce Lee's Huge Bronze Statue Turns Into a Mecca in L.A.'s Chinatown". LA Weekly. ^ Woodson, Joy L. (August 13, 2003). "Ringing in a New Era in Old Chinatown". Los Angeles Times. Retrieved 14 March 2016. ^ "Articles about Haing S Ngor - Los Angeles Times". Los Angeles Times. ^ AsianWeek" Staff and Associated Press. "Philadelphia Chinatown Wins Stadium Fight Archived September 26, 2011, at the Wayback Machine. AsianWeek. November 24–30, 2000. Retrieved on November 8, 2011. 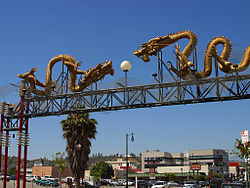 ^ "Chinatown Los Angeles". Chinatownla.com. Retrieved 2013-08-17. ^ Zahniser, David (March 23, 2019). "Amid gentrification fears, L.A. approves 725-unit apartment project in Chinatown". Los Angeles Times. Retrieved 2019-03-23. ^ a b c d "Chinatown, Los Angeles". Statistical Atlas. ^ "Evans Community Adult School". Evans Community Adult School. ^ Baer, Stephanie K. (August 22, 2015). "Peking duck is so important to Chinese culture it got a health code exception. Here's why". The San Gabriel Valley Tribune. Retrieved 19 January 2016. ^ Reichl, Ruth (January 13, 1991). "Grab That Cart! : Ocean Seafood has quickly become the place for dim sum in Chinatown, and no wonder". Los Angeles Times. Retrieved November 10, 2013. ^ Gold, Jonathon (April 17, 2015). "At Empress Pavilion in Chinatown, it's not 1991, but not bad either". Los Angeles Times. ^ STEIN, PAT (February 12, 1998). "Can you do downtown L.A. on foot? You betcha!". The San Diego Union - Tribune. p. NIGHT.D. ^ a b Thursby, Keith (September 2, 2010). "William 'Bill' Binder dies at 94; ran Philippe's eatery". Los Angeles Times. Retrieved 2010-02-26. ^ POOL, BOB (October 8, 1998). "After Many Years, Little Joe's Will Just Fade Away". Los Angeles Times. p. 1. ^ Mallory., Michael (December 2, 2002). "They're empty, but full of promise; Renting out vacant buildings as film locations can fill the needs of owners, production companies and the community". Los Angeles Times. p. E.6. ^ Rasmussen, Cecilia (2003-07-13). "Pasadena's Gold Line will travel a history-laden route". Los Angeles Times. Retrieved 2012-07-29. ^ "City of Los Angeles Department of Recreation and Parks". Laparks.org. Retrieved 2013-08-17. 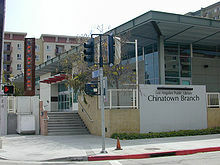 ^ "Chinese Chamber of Commerce LA". Lagoldendragonparade.com. Archived from the original on 2013-09-01. Retrieved 2013-08-17. ^ "L.A. Chinatown Firecracker". Firecracker10k.org. 2013-06-30. Retrieved 2013-08-17. ^ "Welcome to Miss LA Chinatown Pageant". Misslachinatown.com. Retrieved 2013-08-17. ^ a b "Film locations for Chinatown (1974)". Movie-locations.com. Archived from the original on 2013-09-18. Retrieved 2013-08-17. ^ "Hollywoodusa.co.uk". Hollywoodusa.co.uk. Retrieved 2013-08-17. ^ "Filming Locations of I Love You Man - part 2". Seeing-stars.com. Retrieved 2013-08-17. ^ a b c "Films in Old Chinatown". Old Chinatown Los Angeles. ^ Makinen, Julie (October 27, 2015). "Did a Chinese casino really just pay $70 million for a 15-minute Martin Scorsese film?". Did a Chinese casino really just pay $70 million for a 15-minute Martin Scorsese film?. ^ "Bio". Lisa See. Archived from the original on 2014-02-04. Retrieved 2013-08-17. ^  Location of the Weyse residence on Mapping L.A.